A Bronx Girl's Tale...in Malta! : 5 months down, less time to go...WHAT?!?!?! How did this even happen? How is it possible that I have officially reached the point where the time spent here is now more than the time I have left? <Insert Panic Mode>. I feel like there is still so much to do, see and experience and the old adage of so much to do, so little time keeps playing in my head on repeat, annoyingly enough. Only thing left to do is make sure I get to see and do all I want and I am definitely getting there. These are just to name a few. The unfortunate thing is that I have to wait until the weather gets a bit warmer to do most of these things so until then, I decided to do the next best thing to occupy some down time....volunteer. 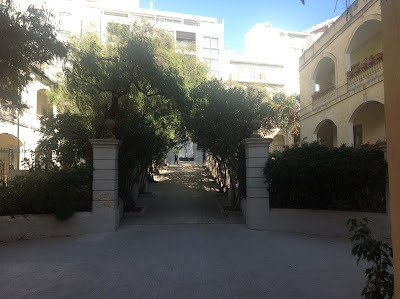 I realized I wanted to be able to find something else to be involved with and when I first arrived here I found a pamphlet on the North Malta Girl Guides. Since I took my time settling in and traveling a bit, I waited until January to start working with them. They are part of the same organization as Girl/Boy Scouts. I volunteer at the Sliema chapter, which is the largest on the island and affiliated with the church school they work from. That school is like night and day from the state school where I work. I call it my secret garden because it truly is such a beautiful school and although it is a church school vs. a state school and in a better neighborhood, it doesn't mean they are not faced with the same struggles with students although you would never know given how well the girls speak English. I work with the Brownie group, ages 7-10 years old and they are adorable. It is a 2 hour commitment that I truly enjoy because I have gotten to know yet a whole other community of people here that are really great. The head of the troop, Carmen, is wonderful, so good at her job, so nurturing, a true mother and guider. What I enjoy most volunteering with them is that there is always a message and lesson to be learned through their activities. They remind me how important it is to reflect and to be open to the positive things that take place because it is so easy to miss them when there are moments of too much negativity and sadness. 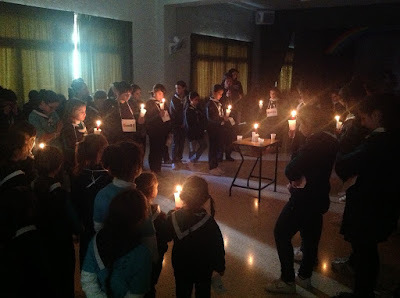 The organization has what they call Thinking Day, in honor of the birthdays of the husband and wife that began the guiding organization and it was held last Friday. It was really beautiful and inspiring to see them speak of issues that other countries are faced with and the struggles they endure everyday and how important it is to say a prayer and to keep those less fortunate in our minds and in our hearts. Just a truly beautiful moment that I felt honored to be part of. I have been with them for over a month and I know they will be a group of women and students that I truly will miss. 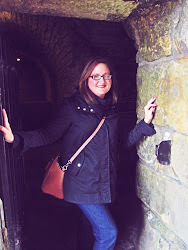 I also began another volunteer opportunity that Fulbrighter's were contacted about to apply. I volunteer with an organization that is based out of NYC that works with NYC schools and have branched out to Minnesota and North Carolina. They basically run a geography program because they realized how unaware kids are of the world they live in. I officially became a Travel Correspondent with them in the middle of February and it looks like it will be a really cool adventure. I have been paired up with not only a NYC after school program but one that is in my hometown of the Bronx. I will be corresponding with a 3rd grade class through blogging, video blogging and video conferencing. We have weekly assignments on various topics from food, traditions, nature/environment, etc. that I will share with this class. I am so excited about this for the simple fact that so many Americans know so little about Malta. This class will be experts once the semester is done! 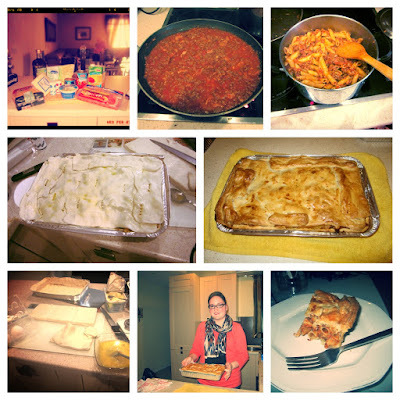 My first field assignment was food so I made the Maltese dish Timpana. It is a take on baked ziti but better because the pasta mixture is baked in pastry dough. I also made the meat sauce from scratch and have to say it really was a success...no really it was, I gave some to a teacher I work with and got the compliment of my life from her mom who said I am learning to cook like the locals, which is apparently a lot coming from her, it really was so DELICIOUS!!! That made my day!!! Completing this assignment got me excited for the others to come. It helps me focus more on what is around me and what I am doing here which is pretty sweet; the bonus is that I have an entire class I get to share it with! So as you can see I have decided to take a bit of a different approach for this 5 month recap. I chose to focus on the things I am doing here and how they are helping me appreciate my time, whatever time I have left on this island, because it is flying by and before I know it , it will be time to head home to the states. You have to be in the moment to make sure you have truly appreciated it and that's exactly what I am doing.